North Bend is a city in King County, Washington, United States on the outskirts of the Seattle, Washington metropolitan area. The population was 6,739 in a 2016 census estimate. Aerial view of North Bend, Washington with Mount Si. Brenden Elwood, Alan Gothelf, Trevor Kostanich, Ross Loudenback, Jeanne Pettersen, Jonathan Rosen, Martin Volken. Since the closure of Weyerhaeuser's Snoqualmie sawmill, North Bend has become a prosperous bedroom community for Seattle, located about 30 miles (48 km) to the west. The town was made famous by David Lynch's television series Twin Peaks, which was set and partially filmed in North Bend. North Bend is also home to Nintendo North Bend, the main North American production facility and distribution center for the video game console manufacturer Nintendo. Downtown North Bend, WA with Mount Si 1900. Jeremiah Borst (1830–1890) father of the Snoqualmie Valley community. 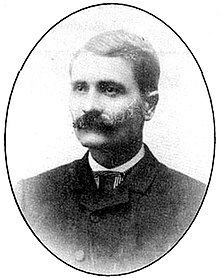 William Taylor (1853-1941) founder of North Bend. Downtown North Bend, WA 1943. The Snoqualmie Indian Tribe has resided in the Snoqualmie Prairie, including the area now known as North Bend, for thousands of years. This prairie southeast of Snoqualmie Falls was the ancestral home, hunting and forage grounds for the Snoqualmie people and was located in the upper Snoqualmie Valley near the Snoqualmie River fork confluence, Mount Si and the western foothills of the Cascade Range. One of the first explorers to the upper Snoqualmie Valley was Samuel Hancock who arrived in 1851. Hancock traveled up river with his Snoqualmie guides, fording canoes around the falls to reach Snoqualmie Prairie, searching for coal deposits. He was taken to a "very extensive and fertile prairie" about two miles above Snoqualmie Falls. The beautiful open grassland came to be known as the Snoqualmie Prairie; the heart of which is now known as Tollgate and Meadowbrook farms. The Snoqualmies, led by Chief Patkanim, later sided with early settlers in the 1850s Indian Wars and were one of the signatory tribes of the Treaty of Point Elliott in 1855, which failed to designate an Indian reservation for the Snoqualmies. Some of the soldiers in those wars, such as the brothers and sisters Kellogg, established cabins near remaining Snoqualmie blockhouses; however the first permanent American resident in the valley was Jeremiah Borst, who arrived in 1858. After the Homestead Act of 1862, more settlers ventured to the Snoqualmie Valley, with the first families settling near Borst on the easterly end of Snoqualmie Prairie. In 1865, Matts Peterson homesteaded the site that ultimately became North Bend. In 1879, Peterson sold the property to Borst and moved east of the Cascades. Borst wrote to Will Taylor, who had left the Northwest to pursue mining in California, and offered him the Peterson homestead in exchange for labor. 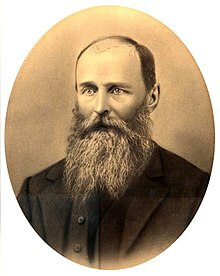 Taylor returned and became the driving force in developing the town while expanding his property to include a thriving trading post and boarding house for travelers over Snoqualmie Pass. On February 16, 1889, with the upcoming railroad boom, Taylor formally platted a town including his farm, upcoming street plans and building lots, giving it the name Snoqualmie. Later that summer competing Seattle land speculators subsequently platted nearby Snoqualmie Falls choosing a similar name. Pressured by demands of the Seattle, Lake Shore and Eastern Railway to avoid confusion, Taylor reluctantly renamed his town Mountain View. However, the United States Post Office Department objected to Mountain View as a town already existed in northern Whatcom County. To conclude the matter Taylor agreed to permanently rename North Bend after its prime location near the large northward bend of the South and Middle Fork of the Snoqualmie River. Taylor was proud of his new, thriving town, but by historical accounts "He never got over having his town name taken away". North Bend was officially incorporated on March 12, 1909 and throughout the 20th century continued to grow with an early economic focus on logging, sawmill production, agricultural and dairy farming. North Bend is located at 47°29′38″N 121°47′10″W﻿ / ﻿47.49389°N 121.78611°W﻿ / 47.49389; -121.78611 (47.493831, -121.786247). According to the United States Census Bureau, the city has a total area of 4.31 square miles (11.16 km2), of which, 4.27 square miles (11.06 km2) is land and 0.04 square miles (0.10 km2) is water. North Bend is located in the foothills of the Cascade Range just 31 miles (50 km) east of Seattle in the upper valley of the Snoqualmie River. The nearest town, Snoqualmie, Washington, is located about 3 miles (4.8 km) to the northwest. Both towns lie near the center of the Mountains to Sound Greenway. The most prominent geological feature nearby, Mount Si looms over the town. To the south is Rattlesnake Ridge. 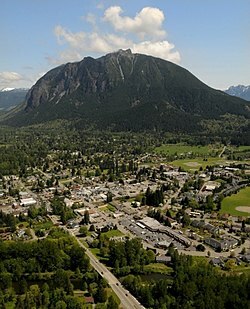 Mount Si stands at 4,167 feet (1,270 m) and towers above the town, itself at around 440 ft (130 m). A 4-mile (6.4 km) trail zig zags up to the summit with a vertical climb of 3,500 feet (1,100 m). North Bend annexed Tanner, Washington and the Stilson area July 6, 2009. North Bend's climate is warm and generally dry during the summer when high temperatures tend to be in the 70s and mild to cold during the winter when high temperatures tend to be in the 30s and 40s. The town’s location in the foothills means that it receives significantly higher annual precipitation than other suburbs to the west, and also translates into heavier snowfall in the winter. The all-time record high temperature is 105 °F (41 °C) set in 2009. The warmest month of the year is August with an average maximum temperature of 77 °F (25 °C), while the coldest month of the year is January with an average minimum temperature of 29 °F (−2 °C). The annual average precipitation in North Bend is 59.1 inches (1,500 mm) with 14.7 inches (370 mm) of snowfall. Winter months tend to be wetter than summer months. As of the census of 2010, there were 5,731 people, 2,210 households, and 1,487 families residing in the city. The population density was 1,342.2 inhabitants per square mile (518.2/km2). There were 2,348 housing units at an average density of 549.9 per square mile (212.3/km2). The racial makeup of the city was 90.7% White, 0.5% African American, 0.9% Native American, 1.6% Asian, 0.1% Pacific Islander, 2.5% from other races, and 3.6% from two or more races. Hispanic or Latino of any race were 6.4% of the population. The median age in the city was 38.7 years. 26.8% of residents were under the age of 18; 6.8% were between the ages of 18 and 24; 27.6% were from 25 to 44; 29.4% were from 45 to 64; and 9.4% were 65 years of age or older. The gender makeup of the city was 49.3% male and 50.7% female. As of the census of 2000, there were 4,746 people, 1,841 households, and 1,286 families residing in the city. The population density was 1,611.6 people per square mile (623.3/km²). There were 1,889 housing units at an average density of 641.4 per square mile (248.1/km²). The racial makeup of the city was 92.01% White, 0.70% African American, 1.03% Native American, 2.23% Asian, 0.17% Pacific Islander, 1.45% from other races, and 2.40% from two or more races. Hispanic or Latino of any race were 3.79% of the population. There were 1,841 households out of which 37.8% had children under the age of 18 living with them, 57.1% were married couples living together, 8.8% had a female householder with no husband present, and 30.1% were non-families. 23.7% of all households were made up of individuals and 10.8% had someone living alone who was 65 years of age or older. The average household size was 2.53 and the average family size was 3.01. In the city the population was 27.3% under the age of 18, 6.7% from 18 to 24, 37.1% from 25 to 44, 18.4% from 45 to 64, and 10.6% who were 65 years of age or older. The median age was 34 years. For every 100 females, there were 97.5 males. For every 100 females age 18 and over, there were 94.0 males. The median income for a household in the city was $61,534, and the median income for a family was $69,402. Males had a median income of $57,333 versus $38,401 for females. The per capita income for the city was $28,229. About 2.1% of families and 4.7% of the population were below the poverty line, including 5.1% of those under age 18 and 3.0% of those age 65 or over. The McGrath Hotel is located on the site of the cabin of William Henry Taylor, who platted North Bend in 1889. In October 1921, Jack McGrath and his wife Caroline purchased the site of their future venture, McGrath's Café; construction was completed as a one story restaurant in 1922. In early 1926 the building was expanded two window bays westward, creating the hotel lobby (now the restaurant bar) and a second story was added to the entire structure to accommodate the hotel rooms of the new McGrath Hotel. After several years of deferred maintenance, the McGrath was purchased in 2000 by a local couple who spent two years rehabilitating the building. It is now listed on the National Register of Historic Places. The first floor currently houses a popular restaurant, The Iron Duck Public House. On April 9, 1941 the North Bend Theatre opened its doors. It has continued operating as an independent movie theater since that day. In 1999, the theatre underwent a major renovation to make it more modern. In 2013, the theater was once more saved from extinction by a successful $100,000+ fundraiser to convert the theater from 35mm cellulose to 4K digital video. During this series of renovations every part of the building was improved without sacrificing the distinctive character of this 1941 Art Deco theater. Valley Center Stage is a downtown community theater that promotes the performing arts in all its aspects. The theater has regular shows featuring classics and comedy. In addition, the theater offers opportunities to valley residents to participate in the theater's productions. The Snoqualmie Valley Historical Museum, operated by the Snoqualmie Valley Historical Society, has been sharing the history of the Snoqualmie Valley for over 50 years. The Visitors Information Center is operated by the North Bend Downtown Foundation and represents a significant step towards downtown revitalization and growing community pride through volunteer efforts. The Mountain View Gallery features local artwork and hosts special events for the community throughout the year. The modern Northwest Regional style center features easy to use touchscreen computers for visitors to access a variety of information on local attractions and history. North Bend is located 30 miles (48 km) east of Seattle on Interstate 90. There is regular bus service provided by King County Metro Transit on route 208. Metro buses are outfitted with bike racks. There are a number of van pools to Redmond, Bellevue, Seattle, and Renton. Snoqualmie Valley Transportation provides door-to-door transportation for the public in North Bend, Snoqualmie, Preston, Fall City, Carnation, Duvall and Monroe. North Bend has a fairly modest trail system. The Snoqualmie Valley Regional Trail stretches from Duvall, WA through Carnation, WA, Fall City, WA, Snoqualmie, WA, through North Bend, WA to Rattlesnake Lake. This 31.5-mile (50.7 km) trail connects to the John Wayne Pioneer Trail (which goes clear across Washington to the Idaho border) and to the City of Snoqualmie's extensive trail network. North Bend also has its own city trail system in downtown, the Si View neighborhood and along the South Fork of the Snoqualmie River in several places. Twede's Café (Mar-T Café) - Founded 1941 "Twin Peaks: Double R Diner"
Throughout the 20th century North Bend has maintained gradual growth with an early economic focus on logging, sawmill production, agricultural and dairy farming. Currently, North Bend is for the largest part a bedroom community to Bellevue and Seattle. In addition, North Bend has a growing tourism economy centered around the North Bend Premium Outlet Mall, Northwest Railway Museum train activities and Snoqualmie Pass recreational commerce related to hiking, backpacking, mountain biking, skiing, snowboarding and cross-country skiing. North Bend also has approximately 400 employees working for Nintendo North Bend. Law enforcement services in North Bend has changed hands several times. From 1973 until March 8, 2014 the city contracted with the King County Sheriff's Office for law enforcement services within city limits. At the time the contract ended it was KCSO's longest standing contract. Effective March 8, 2014 the city now contracts for law enforcement services with the City of Snoqualmie Police Department. ^ "North Bend". Geographic Names Information System. United States Geological Survey. ^ * Evans, Jack R. (1990). A Little History of North Bend - Snoqualmie. SCW Publications. ISBN 1-877882-03-8. ^ a b Majors, Harry M. (1975). Exploring Washington. Van Winkle Publishing Co. p. 86. ISBN 978-0-918664-00-6. ^ "North Bend Beginnings: Snoqualmie (renamed Mountain View, renamed North Bend) Post Office opens on May 20, 1870. - HistoryLink.org". ^ "North Bend -- Thumbnail History". www.historylink.org. ^ "Communities that Thrive". Mountains to Sound Greenway Trust. Retrieved 30 January 2013. ^ Michael Rowe (2009-08-20). "North Bend gets official number on annexation". SnoValley Star. Archived from the original on 2011-12-06. Retrieved 2011-09-19. ^ "North Bend, WA Weather". idcide.com. Retrieved 2009-05-17. ^ United States Census Bureau. "Census of Population and Housing". Retrieved July 26, 2013. ^ "northbendtheatre.com". Retrieved 2 October 2014. ^ "After Successful $100,000 Fundraiser, North Bend Theatre Debuts New State-of-the-Art Movie Projector - Living Snoqualmie". 15 September 2013. ^ "Valley Center Stage - Comedy * Variety * Music * Playhouse". Archived from the original on 2009-04-21. Retrieved 2009-04-22. ^ "Snoqualmie Valley Historical Museum". Retrieved 2 October 2014. ^ "Visitor Information Center". North Bend. ^ "Snoqualmie Valley Transportation". Archived from the original on 6 October 2014. Retrieved 2 October 2014. ^ "Snoqualmie Valley Trail Map" (PDF). duvallwa.gov. Archived from the original (PDF) on 2010-05-27. Retrieved 2009-06-04. ^ "Parks & Trails - North Bend, WA - Official Website". northbendwa.gov. ^ Yam, Marcus (2 July 2013). "Cooling off at the Dairy Freeze". The Seattle Times. ^ "Husky Legend: Fritz Waskowitz - GoHuskies.com - University of Washington Athletics". Wikimedia Commons has media related to North Bend, Washington.